The Lightning Story: Chapter 6 – 2013 A Record Year! The fastest production motorcycle in the world. 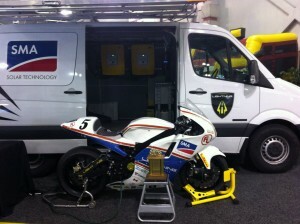 To win Pikes Peak it takes a great motorcycle and a great rider. We invited Carlin Dunne to test our bike at Thunderhill. He had won Pikes Peak the last two years and was interested to ride our bike this year. First we had to get him used to the bike. In March of 2013, we went to Thunderhill in Northern California for a track day. Carlin was surprised and intrigued by the potential of the bike. We worked with him to dial in the suspension and torque. The goal was to get him used to what he could and could not do on the bike. How far could he push it? How much could he slide it in the turns? How much throttle vs. traction? 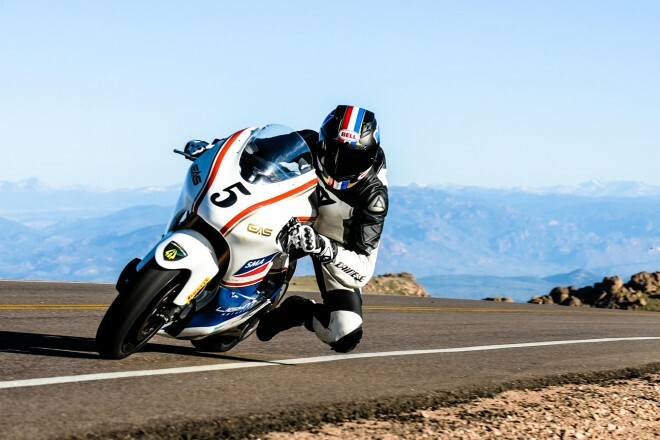 This practice was essential for him to build up the confidence and experience to push the bike to the limit at Pikes Peak. Next we went to California Speedway in Southern California in early May for another track day. Paul Thede and the Race Tech engineers made a major contribution to our Pikes Peak victory by bringing his complete Race Team support truck to fine tune the suspension to Carlin’s exact specifications. By the end of the day he gave us a huge thumbs up. In late May, we headed out to Colorado Springs to begin practicing on the mountain. We loaded up the Sprinter van with two bikes and all our gear. 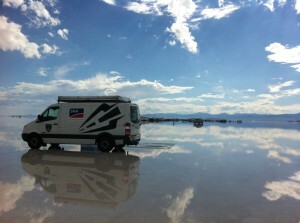 The route was I-80 through Northern California, Nevada, Wyoming and then down into Colorado. Unfortunately we ended up getting a flat tire in Wyoming on Route 80. We had to take everything out of the Sprinter to put the spare tire on it and then put it all back in. However we needed to get a new tire to finish the journey to Colorado and get to the practice sessions. It was late and everything was closed. Finally we found a GM dealer that was open 24hours a day. It turns out that they employed Wyoming Tech students working the night shift. They helped us change the tires and even took us to dinner. At 11pm we left Wyoming and had to be on the mountain in Colorado at 4am. We arrived at the motel at 3:30am and met Carlin who had flown in from Santa Barbara. We showered and went up to the mountain. We did a full practice with Carlin. After practice we would often go for breakfast with the Ducati Team. We would then go back to the motel and collapse. This became a daily routine. 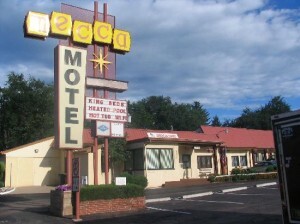 Our operations center in Colorado Springs was the Mecca Motel. All the bike racers stayed there. We spent a lot of time hanging out with the Ducati Team. The Motel owners were great to the bikers. They let us take our bikes into the rooms to work on them overnight. They also set up some chargers near the pool so we could charge the bikes and the Sprinter overnight to be ready first thing in the morning. Pikes Peak is one of the leading tourist attractions in Colorado. It is a National Park. So if you want to use the road you have to do it before the park opens at 9:30am in the morning. Our days would start at 3:30am. We would hit the 7-11 for coffee and get to the gate at 4:30am. As the sun was coming up at 5:30am we would begin our runs. We would get in 9 to10 runs each morning. Carlin would head out on our first bike and the other bike would be on the tire warmers and the charger. All the bikes would run a lap (on some days this would be over 90 bikes) then they would all come back down the mountain. Carlin would then hop on our second bike and go back up. We would plug in the first bike and recharge it and keep the tires warm. We spent every weekend in June in Colorado Springs at Pikes Peak practicing and then the entire last week we were there every day. The other interesting point is that you don’t get to run on the entire course. It is set up so the bikes are on one half of the course and then the cars on the other half. The next day you would switch. We did not get to run the full course until the final week. Pirelli provided us with the tires for Pike Peak. They were key to our win. The Pirelli tires were perfectly suited to the Hill Climb and their race engineer worked with us to make sure they were functioning at their highest possible levels. We were fighting the brakes all the time. There are 156 corners in 12.5 miles of the course. On some of the short straights we would hit over 150mph and then brake for the tight turns. The thin air at the high altitude did not help either since it did not provide as much cooling as at sea level. Enerdel continued to be our battery sponsor as they had for the past three years and those systems performed flawlessly. SMA was our Solar sponsor. 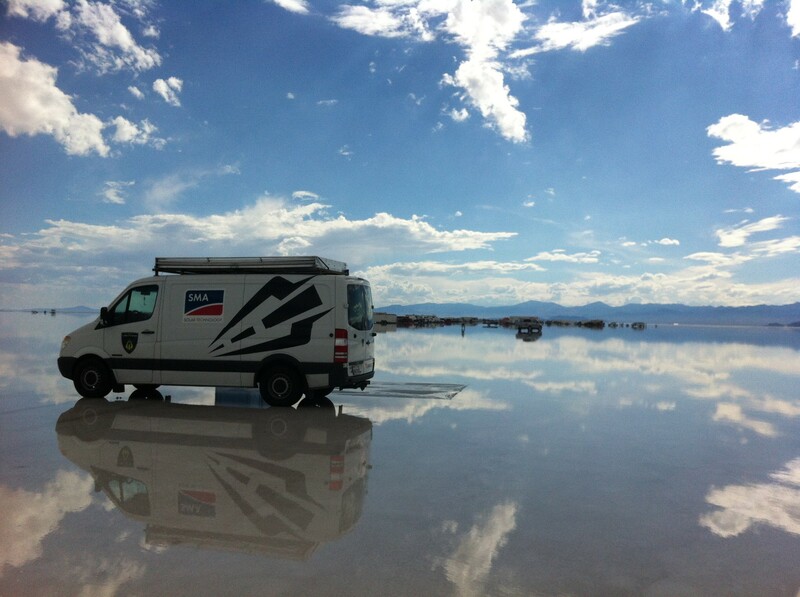 While we were in Colorado SMA sent several of their top engineers to install and complete the SMA solar panel and Sunny Island charger on the Sprinter. They often worked into the middle of the night to get the job done. We have nine solar panels on three platforms on the top of the Sprinter van that unfold and charge the battery packs in the Sprinter. This was the first time that we had everything built into the Sprinter for solar charging. We were completely self-sufficient. No need for power or gas. We were able to compete and win at Pikes Peak by using only the sunlight that fell on our Sprinter. Dana Brown, the director of Step Into Liquid (2003) Dust to Glory (2005), and Highwater(2009) was at the event to film Endless Summer Revisited. 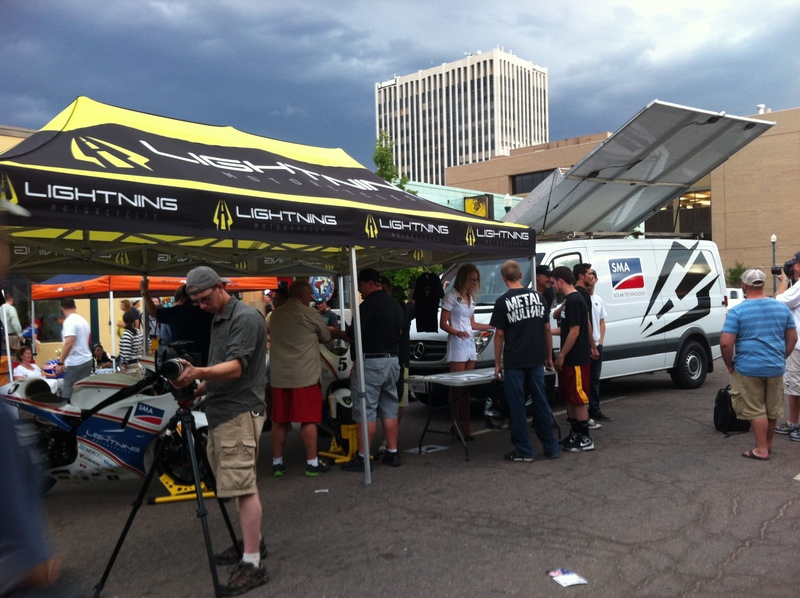 They were shooting film of Carlin and Lightning for part of the movie scheduled out in the fall of 2014. Dana is quoted in one of our videos from the event. June 30th, 2013 – The day of the race. We worked on the bike most of the night and arrived there just as the gate opened. Carlin was one of the last people to run in the open bike class on the day of the race. To prep for the race he spent most of the morning deep into “the zone”… almost meditating and running the race through his mind – totally focused. The racing started in the morning and it was still very cold and wet on the course. Several of the riders had crashed that had gone before Carlin. So times were slower than normal. We had to put a siren on the bike to make sure that people could hear Carlin and the bike coming up the mountain. Even with the siren blasting away he lost several seconds slowing down because people stepped in front of him on the track. From the very start of the race Carlin was in the lead. His performance and times continued to be the fastest. All the practicing paid off. At the finish he was in the lead by 21 seconds over the 2nd place bike. The first time in the world that an electric vehicle competed and won in an open class, international race versus conventional internal combustion vehicles. 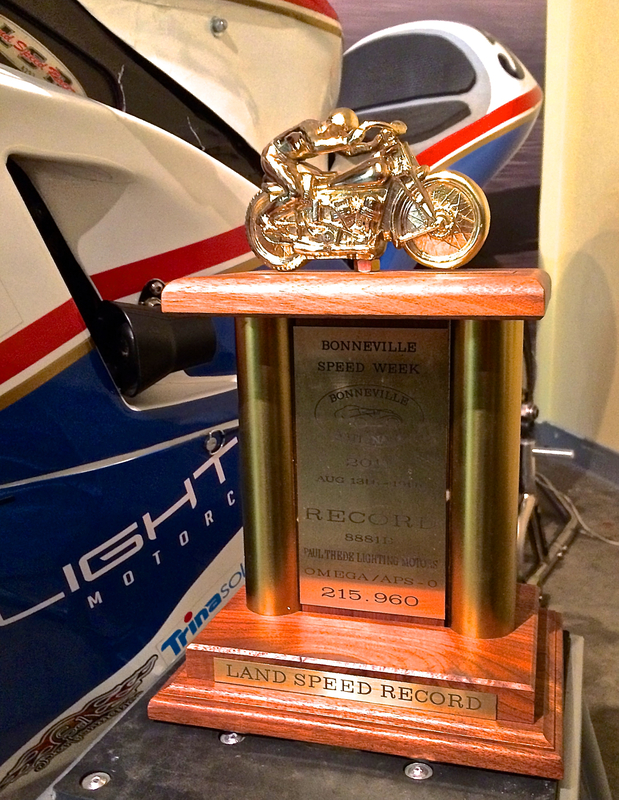 In addition to Pike Peak, we made our usual trip to Bonneville in 2013 and in the process set the FIM and AMA Land Speed records. There was an incredible cloudburst and windstorm and the dry lakebed became a real lake. It took a day for it to dry out. Wind was rocking the vehicles and we had to all hold onto the canopies. 20 minutes of intense rain and we had a lake. We used the SMA solar power the whole week – 5-6 days. Everyone else was running on generators to power their RVs and race vehicles. They also had to transport fuel to the race course. August on the Salt Flats gets very warm so everyone would hang out at the Sprinter because we had the solar panels deployed and they created the only shade for several miles. We ended up bringing extra water and handing them out to the people that would come for the shade and we would pitch them on electric motorcycles. It was a great week and we came away with two more records. To close out the year, in October of 2013 we were notified that we were nominated for the Race Engine of the Year Award by Race Engine Technology magazine. 2013 was a record year for Lightning and we’re looking forward to 2014 to be even bigger.